Ever wondered what it would be like to inherit a winery? In “New Vintage” from our May/June 2011 issue, writer Shoshanna Cohen taps into the lives of three vastly different winemakers who’ve had firsthand experience. And they’re not alone—winemaking is often a multi-generational business. Here are four other stories from people who’ve all been passed the grapevine. Third-generation vintner Frederick Frank had some big shoes to fill. His grandfather, Dr. Konstantin Frank, immigrated to New York from the Ukraine in the 1950 and was the first person to successfully cultivate vinifera grapes in the Finger Lakes region. Since then, the family’s business has continued its successful climb, first with son Willy Frank introducing a line of stellar sparkling wines in the ’80s, and today with third-generation Frederick managing and growing the estate’s affairs as president, while his cousin Eric Volz serves as vice president. As for that fourth generation? 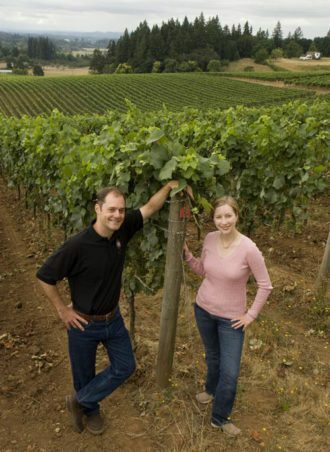 They’ll be ready before you know it—Frederick’s son Kyle currently studies enology at Cornell, and daughter Meaghan will soon start the wine business MBA program at the University of Adelaide in Australia. It’s hard to imagine that four generations ago, the bucolic Airfield Wine Estate operated as a WWII military flight school, given that today the land nestled along the foot of the Rattlesnake Mountains in Washington’s Yakima Valley thrives with rows of grapevines. But the transition didn’t happened overnight. At the end of WWII, the patriarch who owned the land, H. Lloyd Miller, set his sights on ranching, raising everything from sugar beets and rutabagas to cattle and hogs. And the following generation had a change of plans still. In 1968 and with wine on his mind, H. Lloyd’s son Don returned to the ranch after an apprenticeship at Freemark Abbey in the Napa Valley and planted the estate’s first vine clippings. Growing up “in his dad’s hip pocket,” as he describes it, Chris Figgins always knew at some point he’d be in charge of the Walla Walla wine estate his parents Gary and Nancy founded in 1977. And after graduating with a degree in horticulture, Chris returned to his childhood home to learn the winemaking ropes from his father. Now the CEO and director of winemaking at Leonetti Cellar, he helped transition the family’s winemaking production to all estate-grown fruit, launched a second label (called Figgins Family Wine Estates) and, most recently, branched out into another aspect of farming lifestyle—raising free-range, grass-fed cattle for the family’s Lostine Cattle Company. And Chris’s children already show interest in following the same path—at the age of nine, his daughter can identify the different cultivars of grape clusters hanging from the vines. “Now my kids are growing up in my hip pocket, just as I did with my dad,” says Chris. Overproof rum is this tropical cocktail’s secret.